What if our universe depicted in a single image only? What kind of its face? A musician and artist named Pablo Carloss Budassi combining the images obtained National Aeronautics and Space Administration (NASA) and process them with a map logarithmic developed by Princeton University astronomers. 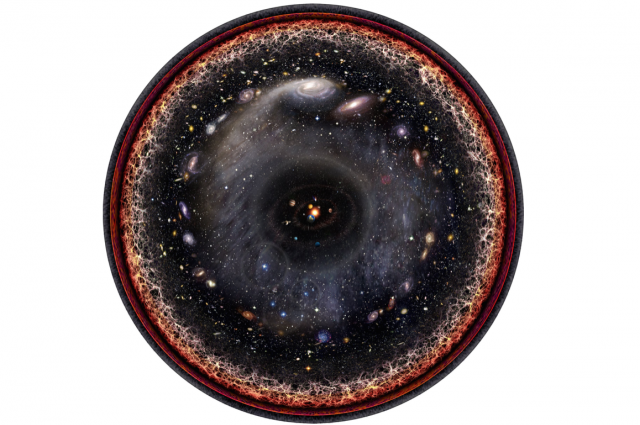 The result is a map of the universe that seems simple, but awesome. In the map, the solar system is in the center. The Oort cloud known as the comets warehouse which is located near the solar system. Milky Way that houses the solar system appears as a circle and the Andromeda galaxy is our nearest neighbor. Near the edge, there is a similar the nets structure. That's called the cosmos networking, complex networks with a composed galaxy. Among them, there are empty spaces, called voids. There is a circle at the edge. It shows that cosmic ray radiation is radiation from the early days of the universe, the traces of the Big Bang that started the time. Finally, in the outer section, there is a quark-gluon plasma. It is sub primordial particles produced by the Big Bang. The sub-particles that fills the universe for the first time. In the map, the more to the edge, the smaller the relative size of objects viewed from the Earth or the solar system.